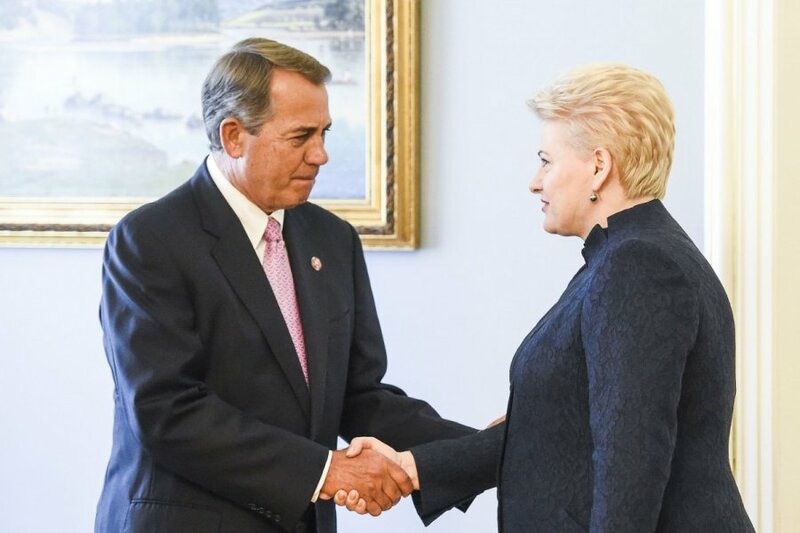 Lithuanian President Dalia Grybauskaitė and John Boehner, the speaker of the US House of Representatives, discussed Lithuanian and regional security issues, the situation in Ukraine, and military and economic cooperation between Lithuania and the US during their meeting in Vilnius on Saturday. "This visit means, first of all, that the United States regards this region and Lithuania as its partner. We state that the United States remains a reliable partner for us both in military security and in economic cooperation. We spoke about military cooperation and the United States' involvement in regional security issues," Grybauskaitė told reporters after the meeting. "The United States has been and will be a country that supports us and a partner that cares about our security and our well-being," she added. According to Grybauskaitė, the US has been taking concrete steps to contribute to security in Lithuania and across the region, including a recent decision to station US military equipment in Lithuania and another five European countries and an earlier decision to allocate 1 billion US dollars for enhancing security in the region. US troops have been successfully working with Lithuanian troops and taking part in joint military exercises. "We discussed the international situation as well -- both within Europe and, in particular, the situation with our neighbor (Russia) and the war in Ukraine. We share the same positions both on the issue of sanctions on Russia and on the situation in Ukraine," the president said. Boehner said that the US understands that the threat posed by Russia "demands decisive leadership and action" and, therefore, it is providing assistance to Lithuania and other partners in the region. "My view is very simple. Neighbors shouldn't be bullying their neighbors. And there's no question that the Russians continue to bully their neighbors. Whether it is arming Ukraine or declaring energy independence, Lithuania sets an example for the region and, frankly, for the world," the speaker told reporters after the meeting with Grybauskaitė. "American people recognize that this threat demands decisive leadership and action. And that's why the Congress of the United States is working to ensure that tangible assistance is provided not only to Lithuania, but to all of our partners in the region. We also continue to work on increasing supplies of natural gas to Europe to help break the manipulation of access to this valuable resource," Boehner said. "We'll always be here and stand with your as friends and as allies," he said. As part of his visit to Lithuania, Boehner is also scheduled to meet with US troops and visit the Klaipeda liquefied natural gas terminal. Boehner, who last January was elected to his third term as speaker of the House of Representatives, is accompanied on his visit to Lithuania by a delegation of seven members of the US Congress. The Lithuanian president had last met with the speaker in Washington in May 2013.